The same dearth was found at the other end of the social spectrum: few sons from peasant families became artists either, despite the fact that agricultural workers accounted for the greatest part of the Italian population. It is not likely that many peasant families considered art a viable way for a son to make a living. The training was too expensive and took away a productive member of the family for a period of years. Few farm families probably had much experience of “art.” A sort of folklore grew up about the handful of artists who did emerge from farm or shepherd families; it generally followed the model provided by Giotto, whose surprising and prodigious talent was said to have been recognized when Cimabue found the boy using a rock to scratch drawings on a stone while tending his flock. “Starlet at the lunch counter” stories like this one also figure in the biographies of Andrea del Castagno, Domenico Beccafumi, and Andrea Sansovino, all farmers’ sons. Even in a work dedicated to describing 106 famous women—Boccaccio’s De claris mulieribus, finished in 1374—the author argued that “art is alien to the mind of women.”3 Attitudes did not change much over the next century; in fact, the growing drive to promote art as an intellectual activity—a capacity society found especially wanting in females—probably worked against it. Women were expected to appreciate art, not create it. Only in the first few decades of the sixteenth century did a handful of women make their mark as professional artists. When, in 1550, Giorgio Vasari published the first edition of his Le vite de più eccellenti architetti, pittori, et scultori . . . (Lives of the Most Excellent Architects, Painters, and Sculptors . . . ), a compendium of artist biographies and a cornerstone of art history (see Vasari and Art History), he included only one woman (see “Excerpts from Giorgio Vasari’s ‘Life of Madonna Properzia de’ Rossi,’ sculptor of Bologna”). The next edition, published eighteen years later, profiled thirteen women. 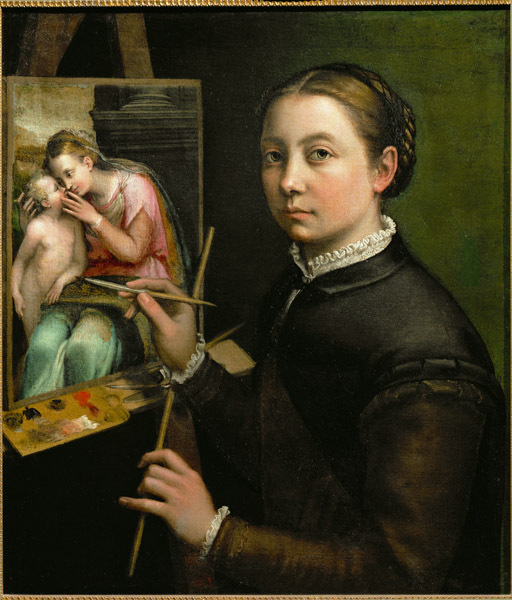 One of those women was Sofonisba Anguissola (see “Excerpts from Vasari’s description of Sofonisba Anguissola”). It has been argued that, other than Michelangelo and Titian, she was the most famous artist of the 1500s, even if much of that fame rested in her novelty. Collectors sought out her portrait as well as her work. In 1559, Philip II of Spain called her to Madrid to serve at his court as an attendant to the Infanta and a lady-in-waiting to the queen, to whom she gave painting lessons. The Anguissola family was among the minor nobility in the provincial town of Cremona, a circumstance highly important to the artist’s future: her rank meant that she not only learned to paint as a gentlewoman’s occupation but also received a good humanist education and exposure to all the arts. In addition to her talent for painting, she was praised for her sweet voice, knowledge of literature, and beauty. All these attributes made her a desirable presence at a royal court. She was taught to paint alongside her six sisters and practiced by painting them. One of her best-known works shows three sisters at a game of chess—a genre-like vignette that had never before been seen in Italy. Unusual for the time, her father not only gave his daughters a strong education in the humanities but was also an enthusiastic promoter of Sofonisba’s talents, even sending one of her drawings to Michelangelo. Anguissola specialized in portraits. Women artists had somewhat freer access than men to female family members and children; the grander genres—a large church fresco cycle, for example—were in most cases unavailable to them. Many of Anguissola’s portraits are witty images of herself, family, and friends. She painted more self-portraits than most other artists of her time, man or woman: at least twelve are known. This one served as a kind of advertisement of her skill as an artist, especially as a portrait artist. Perhaps because of her noble origin she did not shy away, as many men painters did, from showing herself at work, her hands occupied with brush and mahlstick. Other self-portraits show her at a keyboard or reading, evidence of her suitability as a courtier—a beautiful woman who was well educated and skilled in all the accomplishments expected of well-born ladies. Anguissola, who was in her nineties when she died, was followed in the seventeenth century by two other well-known women: Lavinia Fontana and Artemisia Gentileschi. Both were daughters of artists. The reverse of Lavinia Fontana’s medal shows an allegorical figure of Inspiration—a woman seated at the easel, her fervor of creativity represented by her wild hair. Fontana, like Anguissola, specialized in portraiture, but Gentileschi, born sixty some years after Anguissola, moved beyond that limitation.